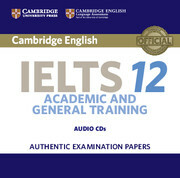 Six full practice tests with tips and training for the 2015 revised Cambridge English: First (FCE) for Schools. 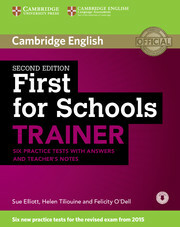 First for Schools Trainer offers six practice tests for the revised Cambridge English: First (FCE) for Schools exam combined with easy-to-follow guidance and exam tips. The first two tests are fully guided with advice on how to tackle each paper. Extra practice activities, informed by the Cambridge Learner Corpus, a bank of real candidates' exam papers, focus on areas where students typically need most help. This edition contains teachers notes and a full answer key. Audio for the listening and speaking test activities is available online for download. Audio CDs featuring the listening material are also available, separately.